Me: What is the matter furry one? Fluff Ball: I am scared of the world and unsure of myself. Me: Well the world can be a scary place sometimes but you shouldn't let that hold you back. 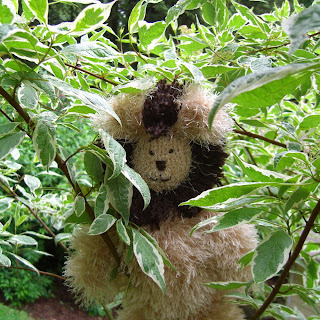 You should be out playing in the garden rather than hiding up a tree. Why are you unsure of yourself? Fluff Ball: I am not sure if I am a strange rabbit as I have large feet - or a teddy bear because I am so soft and cuddly - or a lion because of my soft chocolate mane. Me: Well I don't think you are a rabbit because you don't have a big fluffy tail or big ears. And I don't think you are a teddy bear because you have a soft chocolate mane. So you must be a very fluffy and cuddly lion. 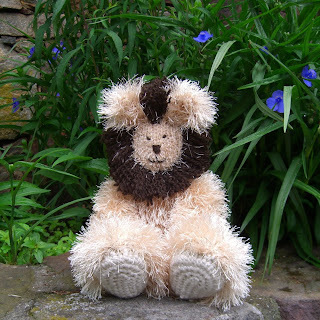 Fluffy Lion: I don't feel like a lion at all - I still feel rather scared. 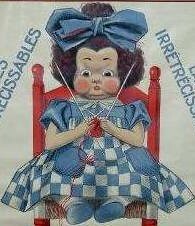 At which point I ran to the sewing machine to make a present for this rather nervous lion and I told him about a young girl called Dorothy who also met a rather scared and cuddly lion and she took him to a special place where he found courage. 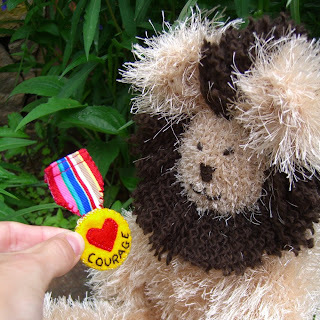 The lion knew that he had found courage because he was given a shiny medal! Me: Would you like this medal of courage? Perhaps it will make you feel braver? and then you can enjoy the garden rather than hiding in a tree. Fluffy Lion: Thank you - that is so kind. 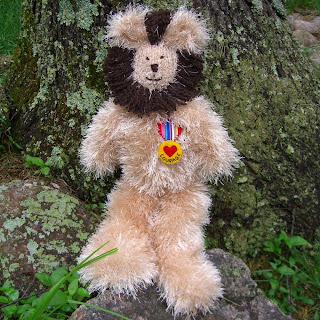 Oh look at the medal - how it sits on my soft furry chest. I feel very special and very brave. So the brave (and very furry) lion lounged in the garden (rather than hiding in a tree) letting out the odd soft and happy growl. Hi Rachael - first of all, thank you for dropping by my blog, and the kind comment. Secondly, gosh you have a lot of lovely craftiness happening here. I've had a lovely time reading. I especially love that felted rabbit (and carrot) - amazing. Hope you don't mind if I come back again? Just so sweet Rachael! I had a good smile at him.. 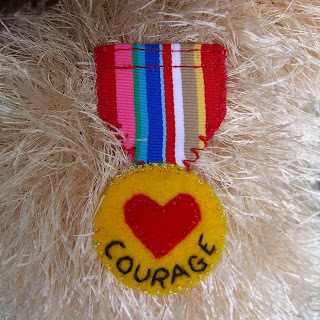 The Lion is adorable - love his badge of courage! whooooo, hes FAB love him !! He is adorable and I love his medal. I am glad he came out from hiding. He's so cute he may be worth tackling fun fur again! He looks so soft and cuddly and just waiting for a cuddle from a little one, he is just lovely! Fluff ball is so cute and well worth all the time and effort you clearly put into making him. Celebrate with me with Cupcakes and Tea?